Prototype: 4 different design German Federal Railroad (DB) express train passenger cars in the version as long distance express / "F-Zug 4" "Merkur", for the route Hamburg-Altona - Frankfurt/Main or Stuttgart. 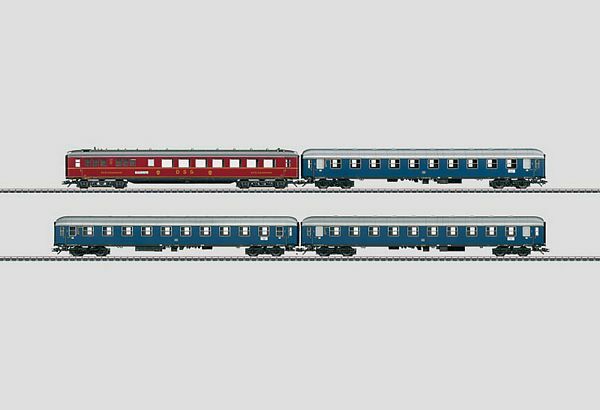 3 type A4üm-61 express train passenger cars, 1st class, cobalt blue basic paint scheme. 1 type WR4üg(e) express train dining car, ruby red basic paint scheme of the German Sleeping and Dining Car Company (DSG). The cars look as they did around 1963. Model: The minimum radius for operation is 360 mm / 14-3/16". The cars have imprinted train destination signs. All of the cars have factory-installed interior lighting with warm white LEDs. One car has a factory-installed pickup shoe and red marker lights. The entire car consist can be provided with power by means of the factory-installed current-conducting close couplers. A permanently defined sequence of the cars is given for this. Total length over the buffers 112.2 cm / 44-3/16". Long distance express / "F-Zug 4" "Merkur", train route Hamburg-Altona - Frankfurt/Main or Stuttgart. 1 car with factory-installed marker lights. The German Federal Railroad's Fast Long Distance Express Trains - At the start of the Fifties the new German Federal Railroad reached back to the prewar tradition of the legendary FD trains (long distance express trains) and came up with a new train class with the "F-Zügen" (international long distance express trains and domestic long distance express trains). These consists were run almost exclusively with 1st class cars and consisted of special cars for important long distance service. The route network for these trains was also called the "blue long distance train network" because of the blue paint scheme for these passenger cars. The muted red of the Mitropa dining cars used on these trains contrasted effectively with the rest of the cars provided the typically dignified look of these long distance trains so highly valued by passengers in the Fifties and Sixties of the last century. The class 03.10 express train steam locomotive goes very well with this long distance train and is also offered under item number 37918 for the "Exclusiv"/MHI program in the Marklin assortment.